INTRODUCING...MOLLY! Molly, wearing number 10, is introduced as a starter for the first time in her first varsity soccer game for Ben Davis High School. To her immediate right (#8) is U.S. national team member Lauren Chaney and nationally-recognized Annie Yi (#7). 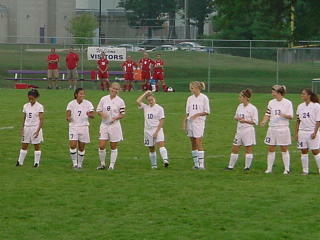 Molly is one of two freshman to start (Brianna Syverson, #11, to her immediate left, is the other). The Lady Giants are ranked in the top five teams in Indiana as the season gets underway. On this night (August 15) they trounced Plainfield, 7-1.